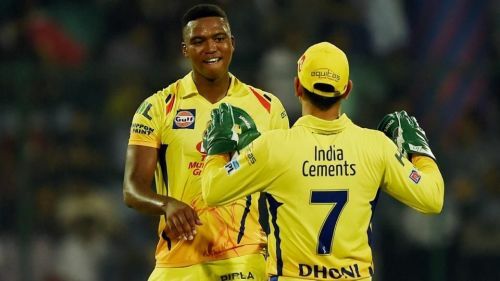 The South African fast bowler Lungi Ngidi won’t be part of the CSK team as he has been ruled out owing to a side strain he sustained during the fifth ODI against Sri Lanka. This will be a big blow for CSK who are just three days away from playing their first IPL match of the season against RCB. Ngidi had an outstanding IPL last year having taken 11 wickets in 7 matches at an astonishing economy of 6. CSK would definitely miss him big time. With only David Willey as the other overseas fast bowler in the squad, CSK will have to immediately fill up the void created by the injury to Lungi Ngidi with another overseas fast bowler. There are three possible overseas fast bowlers to look into for CSK. Mark Wood was part of CSK’s original squad last year. He played only the opening match against Mumbai Indians and didn’t get a chance to play any other match thereafter. Wood had a decent first over in IPL conceding a mere 2 runs. But his next 3 overs went for 47 runs as the Pandya brothers took a liking to him. When Kedar Jadhav got injured last year, CSK decided to replace him with an overseas player David Willey. As a result, they had to release one overseas player at the beginning of this year to bring down the number of overseas players in the squad to the maximum permissible limit of 8. CSK chose to retain David Willey and release Mark Wood. Wood’s current form has been encouraging. He played his last T20I against the West Indies on March 10, 2019, and recorded excellent bowling figures of 3-0-9-3. Wood along with another CSK overseas bowler David Willey(4 for 7) bundled out the West Indies for 71 in that match. In the ODI series that preceded the T20I against the West Indies, the pacer claimed 7 wickets in 4 matches. He has the ability to clock on an average speed of about 140 KPH consistently. Since he has been with the CSK set up before, he would be the ideal replacement for Lungi Ngidi if the CSK management once again decides to bring back a tried and tested player.